See what I mean? 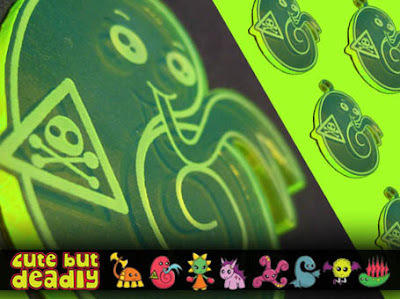 The amazing designs you are looking at above have been created by an exceptionally talented artist and designer by the name of Exit Man. 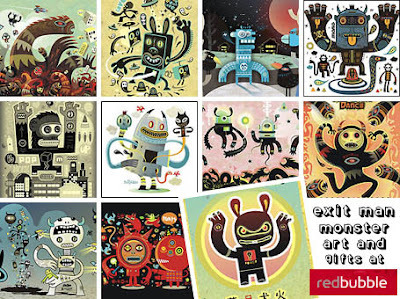 And at the Exit Man RedBubble shop you can pick up these marvellously monstrous creations on posters, cards, prints and more. 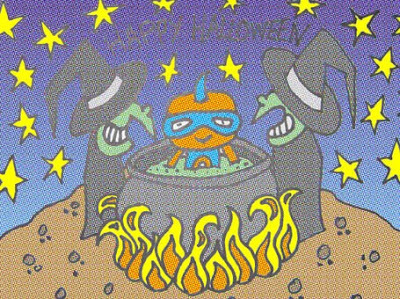 And the absolute best part is… you definitely don’t have to wait for Halloween to treat yourself to these wonderful works! Incredible, isn’t it? 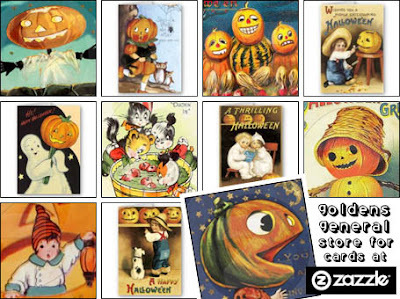 The amazing works you are looking at above are just a fraction of the beautifully restored vintage cards available from Golden’s General Store at Zazzle. And don’t just think they sell Halloween cards either! This shop has got vintage cards for every occasion, and posters, and clothing, and much, much more besides! So the next time you’re looking for a timeless classic to surprise your friends with, you’ll know where to go, wont you? What you are looking at above are just some of the fantastic creations available from Monster2Market. 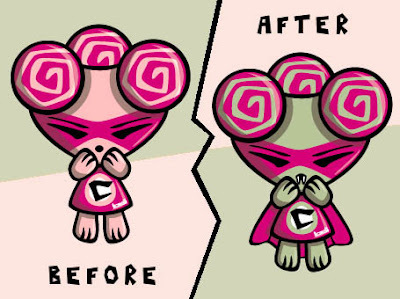 And yes, you’re right, they really are that cute! 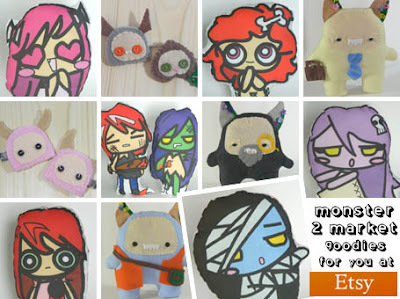 Monster2Market is an utterly adorable Etsy shop that sells some seriously sweet creature creations - including plushies, stickers, hairclips, keyrings, and more! In fact, it’s even got some customised dolls in there too! Perfect! Marvellous, isn’t it? 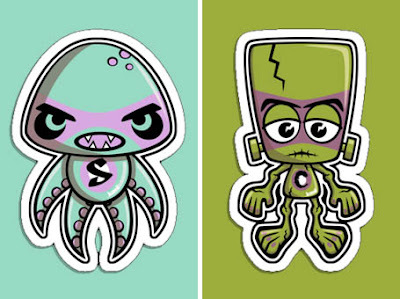 Kangarookid is a very talented artist and designer who creates magnificent monsters, the likes of which are sure to get any Halloween fan in the mood for tricks and treats aplenty! 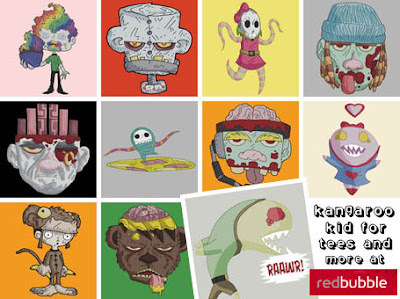 At his RedBubble store you can buy these monstrous creations on t-shirts, stickers, posters, cards, and more! And, I’m more than happy to report, he’s even got some zombies too! Happy days! Ta da! 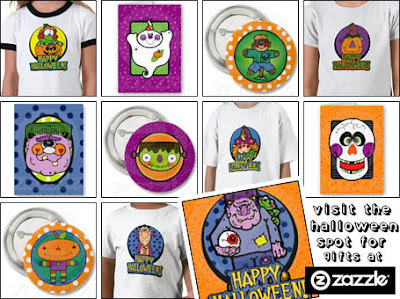 What you are looking at above is just a sample of the fine goods available from The Halloween Spot Zazzle shop. 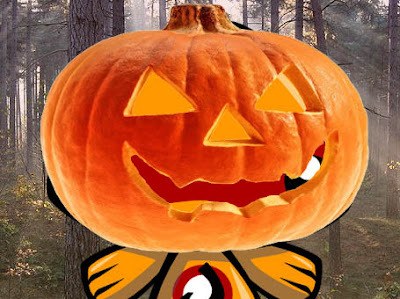 The Halloween Spot sells a great selection of family friendly Halloween clothing, cards, and gifts. And, as if that wasn’t enough of a treat for all you Halloween fans out there, it even sells some seriously cool bags too - just the ticket for carrying all that Halloween candy you’ll be picking up! Have fun! Cutting eye holes in a sheet to create a ghost costume for Halloween will save you money. Doing so in a hotel, however, most definitely wont! Bad news! 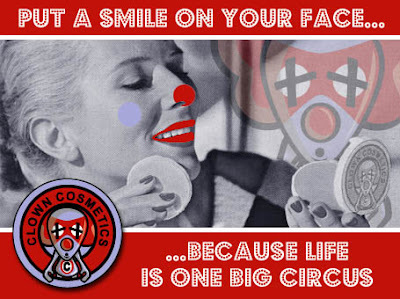 The option of looking on the bright side will no longer be available to you this month! Still, you can always pretend the glass is half full instead! Now’s a good time to start stockpiling sweets! Especially if you don’t want your house egged on Halloween! And F.Y.I. - Fruit is not a treat! 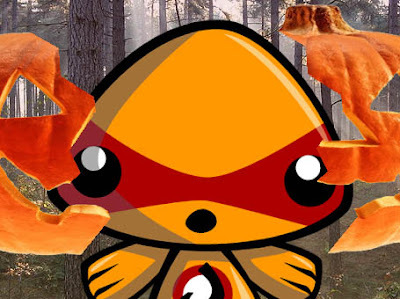 The sudden appearance of a long lost relative could change your life dramatically this month! Although, in reality, this is extremely unlikely! What at first seems like a good idea could prove to be disastrous. Try leaving the thinking to someone else this month. It’ll be safer for everyone! Writing yourself a note to remember something is perfectly normal. Unless that note’s about remembering to forget something! Best remember this! Learning to be gracious in defeat will serve you well in the coming weeks. Yip, I’m afraid it’s gonna be one of those months! Sorry! Avoiding disagreements will be the key to a stress free month for you. And don’t let anyone tell you otherwise! Despite how it sounds, a storm in a teacup is not actually a drink! Remember this to avoid an embarrassing restaurant incident! Pretending to know what you’re talking about when you don’t know what you’re talking about is seldom a good idea! Trust me, I know what I’m talking about! Reading this horoscope prediction will be the most exciting thing you’ll do this month. I do hope you were sitting down when you did it!